Red Sea’s all new ReefLED™ lighting, REEF-SPEC® filtration and circulation systems, customizable fascia and a one-plug control center allow you to focus on the beauty and diversity of your own piece of coral reef, rather than worrying about component selection, suitability and compatibility. 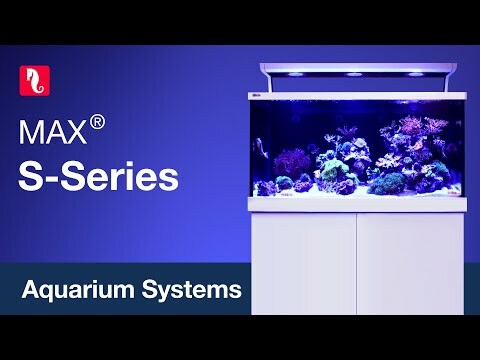 The MAX® S-Series incorporate the all-new Red Sea ReefLED™ 90 lights which are designed to ensure optimal coral growth and maximum rendition of their vibrant colors. At the heart of the unit is a compact Led array that provides a reef-safe range of REEF-SPEC light through a single REEF-SPEC Blue (23,000 Kelvin) channel that consists of an optimum combination of ultraviolet, violet and blue LEDs and an 8,000 Kelvin white channel. In addition, it has a separate dedicated 3W Moonlight channel to provide the low levels of light for reef-safe nighttime viewing. The ReefLED includes a single optical-glass, hollow lens that creates a homogenous light giving a dramatic coral coloration and a gentle shimmer throughout the aquarium. The complete reef filtration system starts with the surface skimmer that feeds the water to the in-cabinet sump via a flow-regulated, silent flow downpipe. The filtered water is returned to the aquarium by a main system pump that can also supply water to additional filtration systems, an optional chiller and/or reactors. The MAX® S-System is supplied with the main system pump, a REEFER Skimmer, mechanical and carbon filtration media and all piping including preparation to connect a chiller and auxiliary reactors.